Exquisite custom-built boarding stairs for the finest yacht and boats. A unique and fashionable means to properly board your vessel. The finest accessories to properly outfit and showcase your vessel. New Wave Fabrication specializes in stainless, steel, and aluminum fabrication for yachts and boats of all sizes. New Wave offers the finest construction in yacht ladders, boat ladders, boarding stairs, accessories of all kinds, and custom fabrication for your luxury boat or yacht. Safe, stylish, stable and durable, New Wave stairs, ladders, and yacht accessories are some of the finest and best products in the marine business. 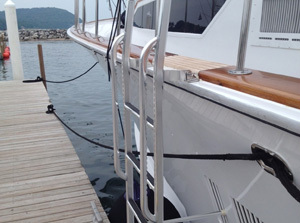 New wave stairs are lighter in weight than competitor stairs and ladders, less expensive, and provide a valuable upgrade for luxury yachts and boats. Choose the Best Ladders and Stairs for your Luxury Yacht! New Wave Fabrication provides these excellent products and virtually any custom fabrication job for yachts and boats of all shapes and sizes, whether you are renovating a classic yacht or enhancing the leisure factor in your chartered fishing boat. The professionals at New Wave will work to understand your project, your requirements and concerns. Your representative may present multiple stainless steel and aluminum solutions depending on your existing equipment and your unique requirements. New Wave enjoys excellent buying power and passes the price benefit on to you whether you are purchasing accessories, or even smaller pieces of hardware such as hinges and stainless steel mounting plates. Custom service, precise fabrication, and expert engineering are all available at New Wave Fabrication. 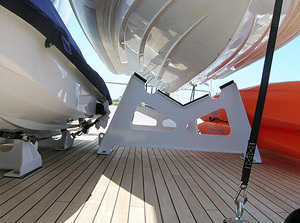 New Wave Offers the Best Yacht Hardware and Accessories. All custom yacht projects are delivered on time and on budget with expert construction, safe design, and stylish finish. New Wave delivers only high quality construction, never cuts corners, and puts your safety and the safety of your passengers first. This is why New Wave takes great care in constructing stairs and ladders that offer premium traction, secure hand rails, and nylon bushings to eliminate electrical activity, in addition to stylish touches with authentic teak woods, aluminum and stainless steel construction. Read our customer testimonials about our products and services. 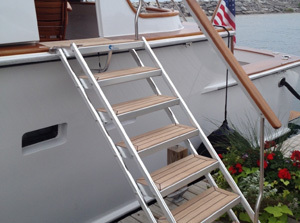 New Wave Fabrication offers the best products and services in the marine business, including fine ladders, stairs, parts and accessories for fine yachts and boats. Contact New Wave for fast and free quotes and consultation on your next marine project large or small. Submit your specifications, measurements or requirements and New Wave will customize a fabrication solution to meet your specific needs. Contact New Wave for the best construction in stainless steel and aluminum as well as other materials for your yacht or boat.